Unsurprisingly, 16 school districts applied to the State Finance Council for “extraordinary needs” funding in August to help cover growing enrollments. Under the new block grant system, that’s the only way to get additional funds. However, the Finance Council granted only a fraction of each request. The districts were told that block grants already provide a record $4 billion in aid. Is that true? Is more money going to the classroom than ever before? Are schools out of line in asking for more funding when enrollments go up? Over a 5-year period that’s an increase of $257 million, but what does that increase pay for? Retirement System Payments (KPERS) — The amount school districts must put into the public retirement system for education employees rises every year. In FY 2011 this payment was a separate funding category. In FY 2016 it become part of the block grant, but school districts must still pay the bill. Local Option Budget Aid — The Kansas Supreme Court ordered lawmakers to increase this aid to solve “equalization” problems between districts. Almost all of the increase was used to lower local property taxes, and did not produce additional classroom resources. Capital Improvement Aid — These funds are disbursed through a formula to help some districts with bond payments for buildings, but do nothing to cover enrollment increases. Capital Outlay Aid — The Kansas Supreme Court also ordered this funding to help some districts cover equipment purchases. These 4 areas more than explain the entire $257 million increase. Each one, considered separately, is a worthy and necessary item, but these areas do not provide general classroom aid—the heart of day-to-day educational activity. 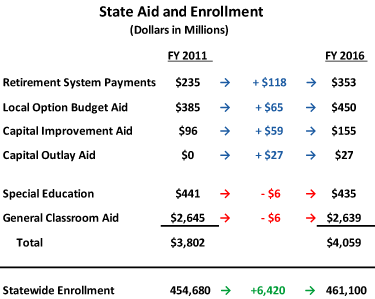 State aid for classrooms has actually gone down in the 5-year period covered by the chart, even when the amount set aside for “extraordinary needs” is included in the FY 2016 total. Yet enrollment in that period went up by 6,420 students. Costs for things like electricity, transportation, salaries, and supplies also went up. Classroom aid goes down, but costs go up. Of course school districts are going to seek more funding. Under the now-expired school finance formula, a rise in enrollment brought more funding to a district. With block grants, school districts must appeal to the Finance Council, but have no assurance that the larger enrollment will be covered. And what about next year? The costs that school districts face will keep going up, but the block grant will stay flat, and that’s the best-case scenario. The state’s financial outlook is so tenuous that even flat funding may not be possible. This block grant system is not a recipe for creating world-class schools. It allows lawmakers to say they put more money into the classroom, but they didn’t. August general fund tax collections were startlingly bad, down $30 million (6.8%) from expectations. August was not a one-month outlier. Tax collections have missed expectations every month since the last official consensus revenue estimate. Anemic tax collections spell trouble for Kansas finances. Lawmakers based the FY 2016 budget on the consensus revenue estimate completed in mid-April. They assumed enough revenue would come in during the remaining months of FY 2015—April, May, and June—and in FY 2016 to leave a meager $88 million in the bank on June 30, 2016. There is little room for error. Everything must work perfectly for the state to just scrape by. But revenue immediately began going off track. April/May/June revenue fell $26 million short of expectations. Now in July and August, the first two months of FY 2016, tax revenue is already $35 million below expectations. 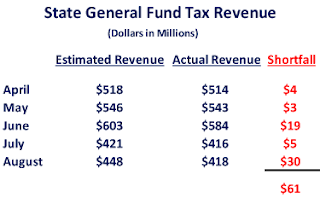 That puts general fund tax revenue $61 million below the assumptions made when the budget passed, wiping out most of the hoped for ending balance. The Department of Revenue released its August report in a new format. Rather than only containing information about the taxes collected by the Department, it also included transfers, interest income, and other small revenue sources. The report format is new for the Department of Revenue, but not new for the state. Kansas Legislative Research and the Division of Budget have been producing reports containing that information for many years, issuing their reports a few days after the end of each month. 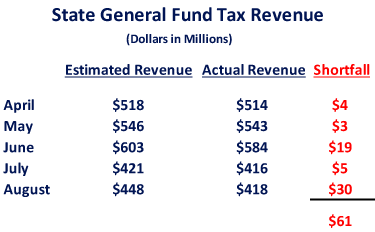 The “new” report does present a more complete view of state general fund revenue, but if misinterpreted can lead to a misunderstanding of the state’s financial situation. The amount collected from tax sources still remains the most important information to track in the report. August tax collections were $30 million less than estimated. However, the report also showed $24 million of “unexpected” transfers into the general fund, allowing the Department to imply August revenue was only off by $6 million. The transfers were not calculated into the August estimate because they had just been ordered at the end of July by the governor. The final version of the FY 2016 budget included $50 million in unidentified expenditure cuts that the governor would make later. The governor did make cuts, but instead of reducing expenditures by the full $50 million the governor chose to transfer $24 million from other funds. The revenue estimators did not know the governor would substitute transfers for cuts when the August estimate was produced. The transfers do not change the financial situation that lawmakers had counted on in their FY 2016 budget, but the shortfall of $30 million in tax revenue in August certainly does. 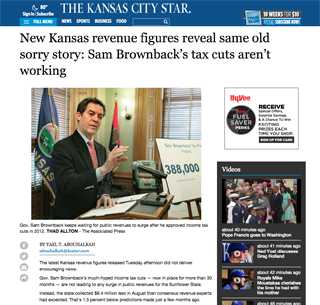 Kansas finances are still reeling from the 2012 and 2013 tax cuts which dropped the state’s revenue stream far below the amount needed to cover basic expenses. Lawmakers have not fixed that yet. State employees and teachers should be celebrated. They provide valuable service in all parts of Kansas, yet have been on the receiving end of both low pay and disrespect, a direct result of the state’s financial crisis. State leaders talk about employees as a problem, or as a cost that must be borne. Last fall, Speaker of the House Ray Merrick told the Wichita Eagle that “Government employees produce nothing. They’re a net consumer.” Governor Brownback has not spoken quite as blatantly, but delivers the same message when he insists on only counting “private” jobs in Kansas to measure his economic experiment. “Public” jobs don’t seem to matter to the governor. Along with the talk, lawmakers have cut away civil service protections, making the state workforce less professional and more subject to political allegiance, and eliminated due process rights for teachers. Then consider pay. This is the seventh year in a row in which employees have not received any kind of cost-of-living or general pay increase. That perhaps was understandable when the state was mired in recession, but as our economy has recovered, Gov. Brownback has not even proposed an employee pay increase for the Legislature to consider. Average Kansas teaching salaries have fallen almost to the bottom at 43rd in the nation last year. Our statewide financial crisis prevents improvement. The Brownback income tax cuts routed Kansas’s budget without bringing any tangible economic benefits. Things became so unbalanced that the record tax increase passed by lawmakers in June barely allows the state to stay financially solvent, let alone address employee issues. Last week 38,000 state employees showed up for work. They engineered our roads and repaired bridges. Some inspected the food we eat. Social workers checked on children at risk for abuse and neglect. At state hospitals and prisons, many worked the night shift or put in overtime hours. Professors, cooks, and maintenance personnel geared up for a fresh contingent of students at universities. Highway patrol officers responded to accidents. Emergency management employees prepared to assist after the next tornado or flood. In Kansas’s public schools more than 60,000 teachers, administrators, bus drivers, and staff took on a half million students who have a wide range of abilities and learning needs. We should be glad all of those Kansans came to work, but we must change our approach to keep a vibrant state workforce. 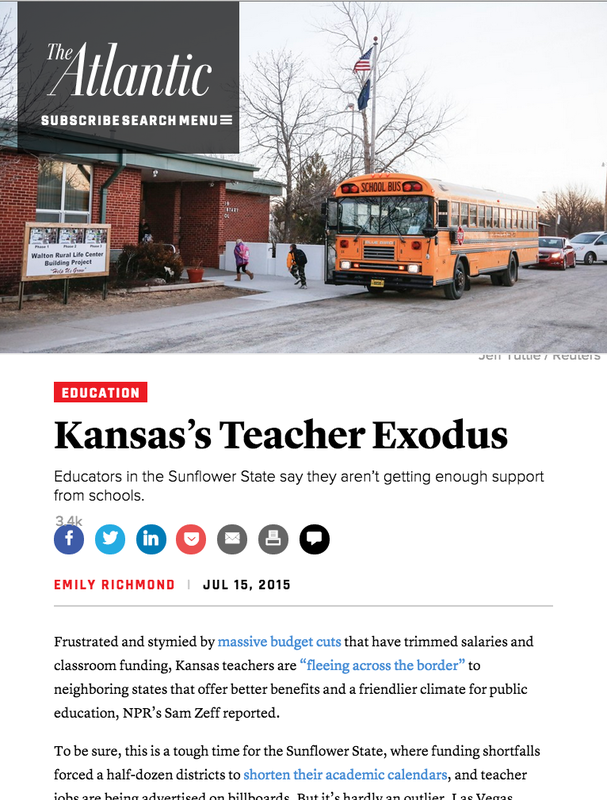 The recent Washington Post article, “Why Teachers Can’t Hotfoot it Out of Kansas Fast Enough” lays out why teachers are leaving. The U.S. is experiencing a national teacher shortage. Kansas will never successfully compete for teachers with an offer of low pay and with lawmakers who malign the profession. The same thing is true in other parts of state government. The Topeka Capital Journal just reported on the staffing problems at state hospitals — for example, 189 out of 501 positions are vacant at Osawatomie State Hospital. KAKE News did a story on similar vacancy problems rampant in the state prison system, a direct result of low pay. The prison system dropped age requirements, and now, for the first time, recruits 18-year-olds as prison guards to fill the void. State employees and teachers understand the message being sent. If you knew that an employer never gave raises, suggested employees were just a financial drain, and routinely took away benefits and privileges, would you want to work for them? Treating employees fairly is fundamental to good business practice and management. Making Kansas public employees bear the brunt of self-imposed financial problems will not serve the state’s future well. 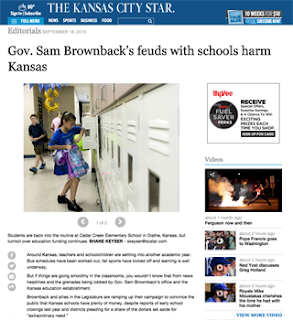 Primary responsibility to set the tone and policies rests with the Brownback administration, but Kansas citizens should not look the other way. Especially as Labor Day approaches, be thankful for the dedicated state workers we have, and tell our leaders to fix state finances and quit dissing the employees.